Drinking to excess, and excess in general, is also historically tied to masculinity. One white male, Hercules, famously got so drunk on Alsatian wine that he left his shield in the Rangen vineyard (his shield is now on the Alsatian flag). Perhaps even male demi-gods, and not just Oedipus, aren’t immune to fetishization. For Karl Marx, commodity fetishism entailed replacing relations between people with relations between objects in a way that masked the social character of, and the actual labor involved in producing, the commodity. In his cornerstone concept of “commodity fetishism,” Marx was trying to show that capitalism had to be viewed in the very terms that it claimed to move beyond. That is, the old relations of people to things, characterized by the mysticism of object animism and spirituality, now reappears in the commodity that seems to have a “magic” value that exceeds its material production. We value the IPhone not because of the (human) labor that goes into it, not because of its material reality, but because of what it represents in the (inhuman) world of commodities. And, obviously, wine collection is commodity fetishism par exemplar. Approaching fetishization from a different direction, Freud and Lacan showed that, once we are out of the womb, our experience is dominated by the “lack” of that originary oneness. The desire for that sense of completion and fullness can never be fully realized, and the fetishized object stands in for that essential lack. But while we can’t always get what we want, we can, sometimes, get what we need. Yet, too often wine seems to stand in for our most base desires: the desire for privilege, exceptionalism, power, and probably most of all, social status. On our trip to Domaine Weinbach, we were treated to a taste of Laurence’s wines; the early bottled varietals were mostly and reliably completely dry, etched in crystal while remaining sublimely rich. The late harvest wines were sweet but never cloying, ice sculptures dripping with zippy tropical fruit and honey. The room was tastefully decorated with unique antiques that, I can only imagine, have belonged to the house for centuries. Perhaps even the Capuchins used that stunning antique stove in the corner? As we tasted, we were transported into a Black Forrest fairytale. Laurence and Catherine’s mother, Collette, who looks like your fairy godmother, floated through passages outside the tasting room—which is also their home—nursing a rare SGN. I recall a certain “wine celebrity” back in the Parker Board days very publically proclaiming that, as he aged and his palate developed, he learned to better appreciate Gewürztraminer. I thought this was odd; Gewürztraminer is such strange grape to turn to like that. And, frankly, most people that like Gewurztraminer at first for its powerful flavors—and many people don’t—tend to go in the opposite direction as they learn to better appreciate balance. But there was a political subtext. To have made this claim at that time, in the way it was made, was also to make an argument for Parkerization. It was a not too subtle endorsement of the unctuous, oily, high-alcohol, lushly fruited, fragrant, blousy version of Gewürztraminer that was favored by Parker Points. And yet, here, at Domaine Weinbach, the Gewürztraminers, while rich, maintained a distinct and undeniable elegance. They were fashioned with an uplifting acidity, never ranging into the fat, oily, and cloying style that dominated during the Parker years. These were spicy, floral, and minerally—fascinating wines that bridged the sleek dinner table style of old-Alsace with a richer modern style, and without falling into the usual traps of modernity. To me there has always been something grotesque about the French penchant for describing wines in gendered terms. And, given their richness, I think that one would have trouble characterizing Weinbach wines as truly “feminine” anyway. But how can we deny that these benefited from a feminine perspective? I like to think that wines like these resist fetishization. I like to think that in the trueness of their statement, they serve as a bulwark against the worst impulses of the wine community. I like to think that their “magic” comes from the transparency rather than the obfuscation of their production. Perhaps you might point out that the Parker crowd appreciated Weinbach wines, which is partially true, or that I’m just fetishizing wine in my own way, which is probably true. In any event, frankly, I’m not sure we appreciated Laurence enough. Domaine Weinbach wines are testimony to a visionary winemaker that should be venerated with the all-time greats. 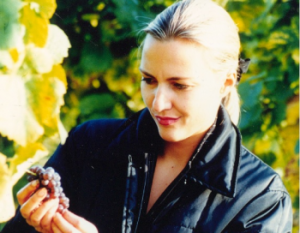 The wine culture needs more people like Laurence Faller, which makes her passing all the more sad.